MSNBC has unveiled some upgrades and a new look to the embedding and sharing portions of its online video player. The new tools allow users to embed video clips at different sizes and adds integrated Twitter, Facebook and Newsvine sharing tools. Users can also trim clips to custom lengths using sliders similar to those seen on Hulu. The size options provide a good level of flexibility for bloggers and other online publishers who may require a certain size to fit their layouts. The embedded version of the player, shown below, has a compact feel that also includes a slickly animated playlist feature. One rather annoying feature, however, is that the code MSNBC provides includes annoying text links below the player, a clear effort at boosting search engine rankings. It’s also interesting to note that in our tests with Firefox, the player causes an Adobe Flash warning to appear. 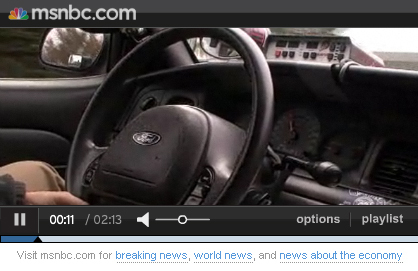 How an MSNBC.com video clip looks on an external page.